We met in an art class together. Loyd was a senior taking art as an elective. I was a freshman taking art for a degree in education. Later, I found that he and I attended the same church. He had a car for the first time, so he offered me a ride to church. After that, we began dating and our relationship began to grow. We were married at the end of the next school year (1956). After that, we moved to Oklahoma for him to complete his MS from the University of Oklahoma. We were in the Baptist Student Union and also attended the home football games. We attended several social activities that were offered on campus. Occasionally, we would go to a movie on Friday evening with another couple. Our relationship began to grow and our first kiss was at the small fish pond between the girls’ dorm and the cafeteria. The campus was so beautiful and we often walked and talked about our future. We became very serious at this point. 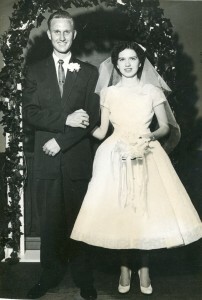 We have been married for sixty years this year. We have two daughters and three grandchildren, one of which is married. We especially remember the Greek Amphitheater where our proposal took place.. The old pine tree between the library and the administration building was also a special place.